Welcome to the June 2015 edition of the IPC e-newsletter. The IPC e newsletter is distributed free to more than 4000 people around the world. Prof Richard Wool, who has died aged 67, emigrated to the United States after graduating from UCC in l969 and went on to become an internationally renowned scientist at the cutting edge of green chemistry. Anand Group Of Industries having 6 production units at Bhopal & catering 7 states in the country, requires GM Technical who is having knowledge of Industrial Paints, Automotive Paints & Water Based Decorative Paints. Salary at par in the industry." Self-cleaning properties remain, in spite of attempts to scratch or scuff it. Self-cleaning surfaces work by being extremely repellent to water but are often rendered useless once damaged or exposed to strong substances like oil. Yet the self-cleaning properties of this new coating, made from titanium dioxide nanoparticles, work during and after immersion in problematic substances and following surface damage. Berger Paints India has commenced commercial production at its Powder Coating plant located at Maharashtra on May 05, 2015. BASF SE's 100,000-metric-ton-per-year nylon polymerization plant in Shanghai has officially come on stream. The company on May 6 inaugurated the wholly owned facility in the Shanghai Chemical Industry Park, which also is home to a world-scale facility for integrated isocyanates, operated by BASF and partners. The new plant makes Ultramid nylon 6 and 6/6 resins. The Rs 64 cr centre will focus on global agriculture research on herbicides, fungicides and insecticides. Chemical major BASF has set up a a research and development centre for agrochemicals at Lonikand, Pune, its first in the country, at an estimated investment of Rs 64 crore. The centre will focus on global agriculture research on herbicides, fungicides and insecticides and will also offer to tailor-made solutions to the farmers. Gema Switzerland GmbH offers its customers and all interested person an even higher added value on its newly designed and revised website. The website shines in a fresh and modern design and focuses on the fast retrieval of information on Gema and its products and solutions for the powder coating branch. The page is not only addressed to loyal Gema customers, who like to learn more about the latest trends in powder coating, but also enables an easy navigation for new customers through the clear and intuitive structure of the new website. The new website content pursues a solution-oriented approach with a high practical relevance and the clear explanation of advantages and benefits of the Gema products and technologies. The user of the website can access the content in different ways to find the perfect powder coating solution. Under the category "Solutions" innovative Gema solutions for typical powder coating problems and requirements are listed and explained with regard to a sustainable application improvement. A high practical value is offered under the menu "Application", where Gema Case Studies demonstrate real areas of applications in powder coating. The category "Products" provides detailed information on the whole Gema product range. Paints and coatings maker Akzo Nobel India today reported a 18.34 per cent decline in net profit at Rs 44.64 crore for the fourth quarter ended March 31, 2015 on lower sales. Kansai Nerolac Paints on Saturday reported a 34.60 percent increase in standalone net profit at Rs 60.37 crore for the fourth quarter ended March 31. The company had reported a net profit of Rs 44.85 crore in the January-March quarter last year. Net sales during the quarter stood at Rs 804.9 crore, an increase of 7.71 percent compared with Rs 747.22 crore in the year-ago period, the company said in a BSE filing. Meanwhile in a separate filing, Kansai Nerolac said it will invest Rs 350 crore to set up a new plant in Gujarat. "The Board of Directors of the company at its meeting has approved setting up of a paint manufacturing unit at Sayakha Industrial Estate in Gujarat having capacity of 42,000 tonnes per year, which is expandable in phases, at an estimated cost of Rs 350 crore," Kansai Nerolac said. 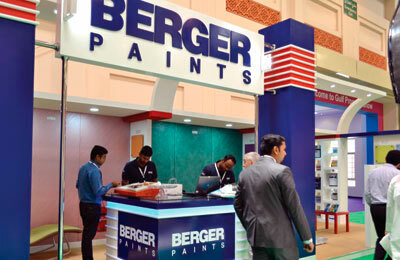 Berger Paints India Ltd has reported a net profit of Rs. 70.68 crore in the fourth (January-March) quarter of 2014-15 against Rs. 57.94 crore in the corresponding quarter of 2013-14. For the full year, the company has posted a net profit of Rs. 266.03 crore (Rs 234.25 crore). The board on Friday recommended a final dividend of 65 per cent on a share of rupee 1. Asian Paints Q4 net up 19%, low vol growth on poor demand Its decorative business recorded single-digit volume growth due to poor demand. AkzoNobel has launched a revolutionary digital system which allows bodyshops to precisely measure and match the existing color on any area of a vehicle. The advanced system consists of two key elements: Automatchic Vision – the latest generation of AkzoNobel's hand-held device that digitally analyzes color; and Automatchic Smart Search – color retrieval software that provides the optimum matching color formula. "Quite simply, we are revolutionizing color matching in the bodyshop," explained Henri Bijsterbosch, Global Manager Digital Color at AkzoNobel's Vehicle Refinishes business. "The compact, hand-held Automatchic Vision device uses the latest digital technology to guarantee precise, reliable measurements of color, including curved parts of a vehicle that are traditionally difficult to read." This is a very interesting problem and one that allows me to dust off my chemistry wizard’s hat to help you understand and solve this caper. Random flat spots can occur when using a rather specific powder cure chemistry. In this case it is technically not a “textured” powder finish but a “wrinkle” finish. In the powder technical world we can create textures through a variety of means. Typically a formulator will load a product with either a dry, absorptive filler or a non-melting particle (or both) to create a texture. The filler dries up the binder to the point of restricting melt flow and thereby creating a texture. The incorporation of non-melting particles (typically PTFE-based, a Teflon®like material) causes protrusions in the powder film and hence a texture reflecting the size of the non-melting particles. So what can you do to correct this problem? I suggest that you find a way to more thoroughly rinse the cleaning solution off the metal. This will eliminate the localized build-up of alkali residue that causes the interruption of the wrinkle. If you don’t want to follow this course of action you could consider switching your powder chemistry from a wrinkle finish to a more traditional texture based on filler or PTFE particles formulating technology. Thanks for the question Aaron. It’s always a pleasure to justify all those tuition payments I made long ago. What makes one powder fluidize better than another? .Particle size distribution (PSD) is the primary factor that influences fluidization. Powder coatings are comprised of range of different sized particles from about 1.0 micron upwards to around 90 microns. The best fluidization occurs with the heart of this range typically 20 to 60 microns. Fines (< 10 microns) tend to agglomerate and impair fluidization. Coarse particles (> 90 microns) are difficult to fluidize because of their mass. Hence the best fluidizing powder coatings possess tight particle size distributions. This means a minimal level of fines and also a minimum of coarse particles. If you employ a reclaim system to capture and recycle oversprayed powder this can be a factor in fluidization. The best suited particles are preferentially deposited on the parts you coat. And as you can surmise, the fines and coarse particles populate the overspray. Reintroducing overspray into your virgin powder feed will affect fluidization. This increasing in the level of fines and coarse may require adjustments to your fluidization process. How do you avoid this problem? The best strategy is to use high quality powder coating from a reputable powder manufacturer. The best suppliers have well-controlled grinding processes that yield relatively narrow PSDs. Narrow PSDs deliver high first pass transfer efficiency and hence less overspray to contend with. A secondary factor that contributes to poor fluidization is moisture. “Wet” powder will be very difficult to fluidize and transport through a powder application system. High levels of moisture are usually due to poor storage and handling of powder coating inventory. Powder should be stored in an air conditioned environment and open bags/containers are to be avoided. In addition you should be careful to avoid introducing “cool” powder into a warmer, moister environment. The cool powder will act as a desiccant and absorb the ambient moisture. It is wise as you move powder from storage to the application area to allow it to acclimate to the ambient application environment before opening the package.Thank you for the question.